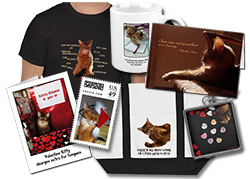 You are here: Home / Diary / My Photo Is in Catster Magazine! 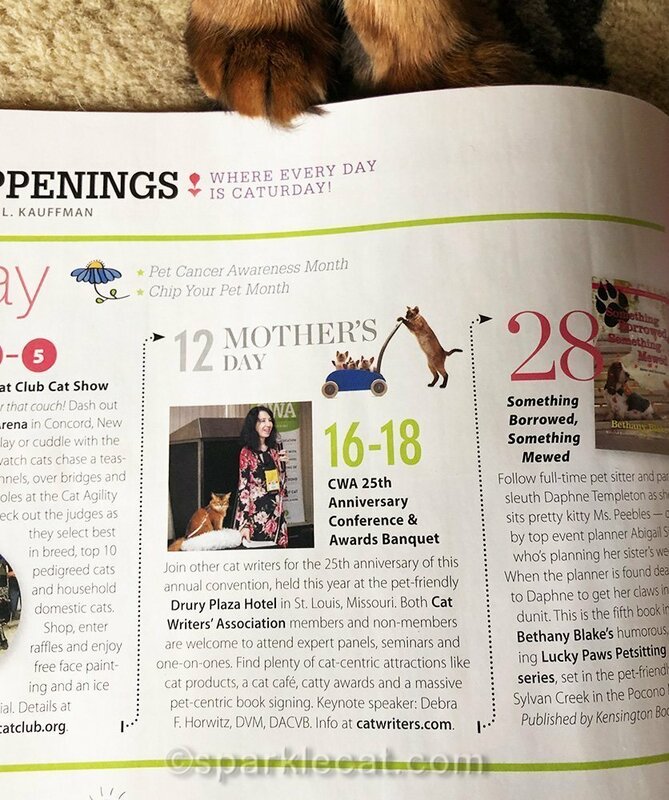 Remember yesterday, when my human and I went to the pet store, looking for a copy of Catster magazine because our photo was in it? It wasn’t there, so my human went to a bookstore she knows that has a big magazine section — and they had it! So she immediately bought a copy and brought it home for me to see. We are on page 6, which is the events page. I can give you a closer look. The photo is from last years Cat Writers Association conference, when my human and I were speaking (well, she did most of the talking). And the conference is happening this year in May, in St. Louis, MO. And my human and I are speaking again! Along with Jessica Spawn, we will be doing a session about Instagram, and how writers and cats can use it to gain an audience. I’m really looking forward to the conference. 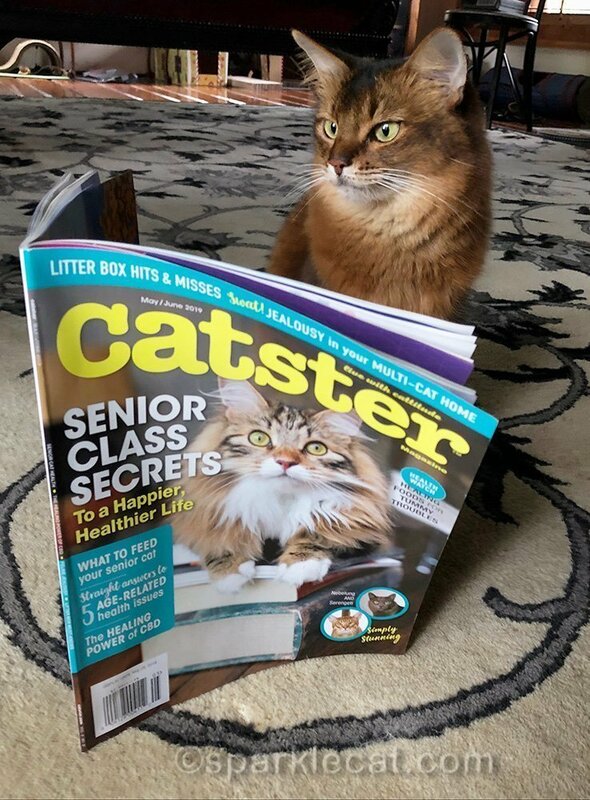 Now, if you’ll excuse me, I’m going to read this month’s Catster. I hope when they do a story on Somali cats, that they ask me for photos! I will even pose special for them. WOWZERS! Great photo of you and your Human ! Guess this means a visit to the pet store for Django, we need to read the article on jealousy. I vote for an article on Somalis – maybe there would be more breeders. Hooman is getting impatient waiting to add to family. Like we need another cat! 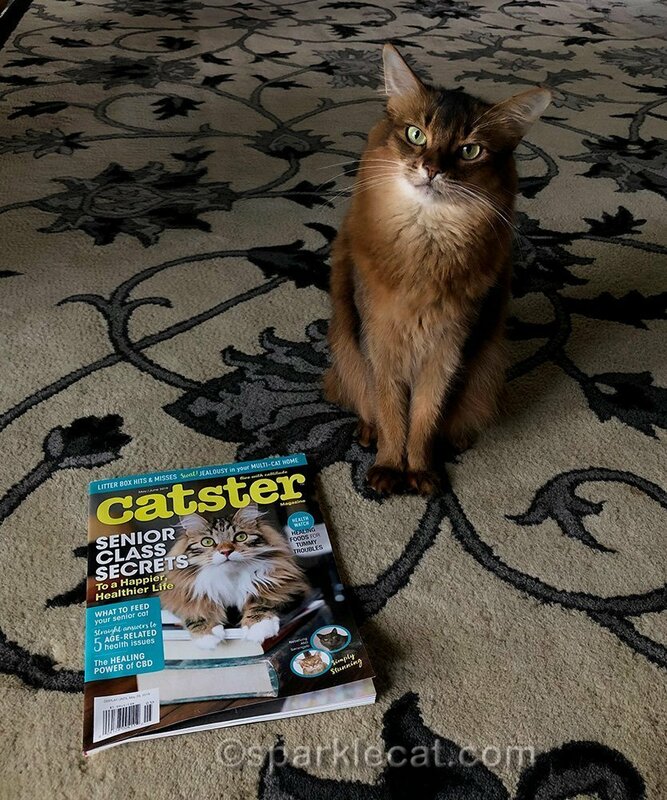 I’ll be sending Mom out to buy that issue of Catster tomorrow. Tee hee hee. Maybe Catster will followup on its article and do a special feature interview with you, ’cause that would be amazing, Sweety Paws. Mom hopes to join CWA as a member this month. Winks. How cool is that, but then again I think you deserve more press coverage and a cover shot at least! You are amzing and desrve your name in lights!!! Summer, we thought that was you and your human! They should have mentioned your name. How remiss of them! Concats Summer and to your human too. How cool! Yoo are a celebrity cat! 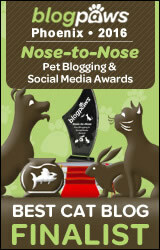 Bing-Binga should be in Catster Magazine, too! Oooo … an Miss Boodie! Congratulations on your human being in Catster, but they should have mentioned your name. I also think you should have been the cover cat too! Coolo! I’ll admit TW hasn’t even opened our’s yet. I’m going bite her for it. We were so excited to see you both in the magazine! it is a good trip this year. Wowzers!!!! So cool! We wish we could come to this year’s event and see you guys! We think there should have been a much bigger article on you, with multiple photos! That is terrific Summer. We agree, your name should be there. But it is very exciting. That’s pretty impressive, Summer! It is well-deserved and not surprising that you are there. Next–a cover?? That is so cool!Our mom said you were a rock star during the talk. She remembers you were watching Binga on the screen, and when your human said something that caught your attention you turned and meowed at her. Guess what??!! Our mom will make it to CWA in time for your presentation! Lexy and I are very happy because we need some serious Instagram help. Summer, how in the world could I have missed that!??? I had to have seen it, surely and I know what you two look like! Congratulations, Summer. You have come a long way in three years. What’s next, a movie? So awesome, Summer! Congratulations to you and your human on being in Catster! And for getting to speak again at the CWA Conference! Awesome Summer – congratulations to you and your Mom. Way cool! Can we have your pawtograph? That is super cool sweet Summer! Name or not you and your mom are celebrities. Way cool. Holy smokes girl! You’re doing pawtographs right? Congratulations!! 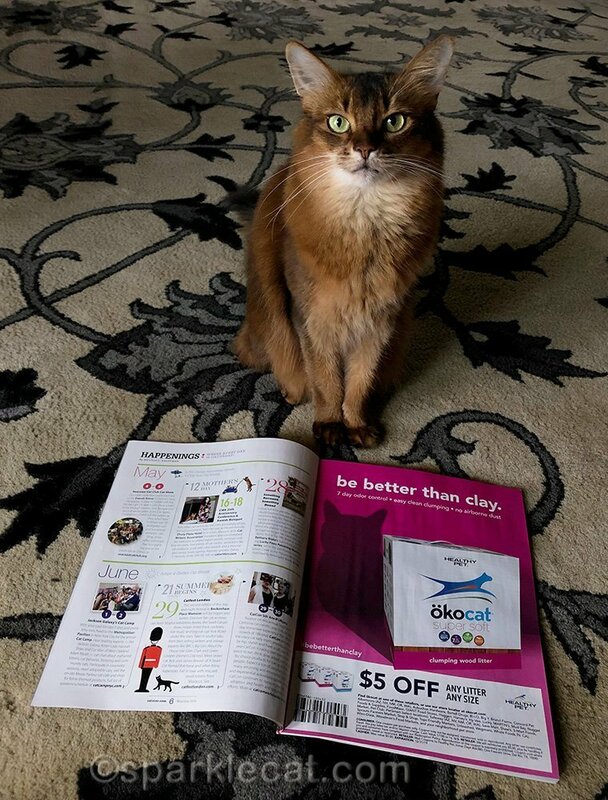 I am glad your human was able to get the magazine. It is exciting to see your photo in it. I agree that they should have put your name there though. Very cool ! But where is your name? ?